Most speciation events probably occur gradually, without complete and immediate reproductive isolation, but the full extent of gene flow between diverging species has rarely been characterized on a genome-wide scale. Documenting the extent and timing of admixture between diverging species can clarify the role of geographic isolation in speciation. Here we use new methodology to quantify admixture at different stages of divergence in Heliconius butterflies, based on whole genome sequences of 31 individuals. Comparisons between sympatric and allopatric populations of H. melpomene, H. cydno and H. timareta revealed a genome-wide trend of increased shared variation in sympatry, indicative of pervasive interspecific gene flow. Up to 40% of 100 kb genomic windows clustered by geography rather than by species, demonstrating that a very substantial fraction of the genome has been shared between sympatric species. Analyses of genetic variation shared over different time intervals suggested that admixture between these species has continued since early in speciation. Alleles shared between species during recent time intervals displayed higher levels of linkage disequilibrium than those shared over longer time intervals, suggesting that this admixture took place at multiple points during divergence and is probably ongoing. The signal of admixture was significantly reduced around loci controlling divergent wing patterns, as well as throughout the Z chromosome, consistent with strong selection for Müllerian mimicry and with known Z-linked hybrid incompatibility. Overall these results show that species divergence can occur in the face of persistent and genome-wide admixture over long periods of time. Genomic studies of natural populations are offering novel insights into adaptation and diversification. In particular, recent studies of parallel evolution of similar phenotypes in divergent lineages have commonly shown the utilization of shared genetic variation. Heliconius butterflies represent a recently documented example of shared allelic variation across species boundaries. Heliconius display bright wing patterns that warn predators of distastefulness and also act as mating cues. The diversity of patterns displayed within and between the hundreds of forms is remarkable, as is the convergence between species onto near-perfect mimetic patterns. Recent field studies have identified a group of populations along the eastern slopes of the Andes that are allied to H. timareta and share wing phenotypes with sympatric H. melpomene. Genomic studies have shown that the populations with similar phenotypes also share allelic variation at wing patterning loci, with adaptive introgression across the species boundary providing the most likely explanation for this pattern. We sequenced a 600 Kb genomic region that regulates diverse red wing pattern phenotypes, using 80 Heliconius samples. Genomic intervals associated with at least three independent red colour pattern phenotypes were resolved using sequence comparisons that grouped similar wing phenotypes, irrespective of species. By comparing the level of nucleotide variation within each colour pattern interval, we estimate the time in generations when introgression events occurred between H. melpomene and H. timareta. Gene exchange after speciation has resulted in the adaptive spread of colour pattern alleles. Here we have identified narrow genomic regions that must act through cis-regulatory control of the transcription factor optix, in order to control complex phenotypes. The wing colour patterns of the Heliconius butterflies are an excellent system to study the evolution of adaptive phenotypes in nature. Previous work has made important progress on the identification of both patterning and pigmentation candidate genes controlling wing colour phenotypes on these butterflies, however, a deep understanding of the genetic and developmental networks shaping Heliconius wing variation is still missing. Here, we have applied a transcriptomics approach (RNA-seq and expression arrays) on developing wings of two morphological and phenotypically different races of the butterfly Heliconius melpomene, in order to make a comprehensive identification of such genes. Across the genome, over 300 transcripts associated with colour pattern phenotype were identified, from which several associated to structural and pigmentation genes. Additionally, the tiling of three major colour loci, namely HmAc, HmBD and HmYb, pinpointed four genes within those genomic regions whose expression differed between phenotypic races, being therefore in association to wing colouration and likely play patterning roles controlling phenotypic “colour switches”. The information here derived constitutes a step forward in the understanding of the genes and pathways controlling colour pattern evolution in Heliconius. Philaenus spumarius (Insecta, Hemiptera, Aphrophoridae) has for long been a subject of interest of evolutionary biologists due to its heritable colour polymorphism that shows evidence of balancing selection and of clinal variation in the colour mophs frequencies. We are studying the adaptive significance of this polymorphism, particularly to understand if the melanic morphs (e.g. “marginellus” morph) have any advantage/disadvantage in terms of survival and reproductive success, efficiency of egg maturation and resistance to desiccation compared to non-melanic morphs (“typicus” and “trilineatus”). Results so far indicate a higher survival, higher number of eggs clutches and higher number of eggs laid by the “trilineatus” females than “typicus” or “marginellus” females. We are also taking a genomic approach for a) the identification of genetic basis of the colour polymorphism and b) for detecting signatures of balancing and directional selection in the genome of P. spumarius. For this purpose we are applying RAD sequencing in a) a set of samples from the three different morphs referred above, using a high frequency cutter enzyme (PstI) and in b) another set of samples from 8 populations across the distribution range of the species representing the main mitochondrial haplogroups, using a lower frequency cutter enzyme (SbfI). We are also assembling a draft of the genome that will aid in the identification of homologous regions to available references, although the very large genome size of this insect constitutes an extra challenge. The Neotropic is the most diverse region in the world. Identifying the causes underlying the observed diversity and spatial structure and unraveling how different factors interact remain outstanding questions. Addressing these questions in the Neotropics provides a unique opportunity to understand the processes that shape the structure of ecosystems. Recent advances in molecular phylogenetics, such as novel tests for diversification scenarios or community ecology phylogenetics, provide new insights into biodiversity questions. The Ithomiini tribe is a species-rich group of Neotropical butterflies, which consists of ca. 380 species widely distributed from the lowlands to 3000 m in the Andes. All species are involved in Müllerian mimicry, whereby different species protected by chemical defenses converge to share the same warning color patterns (mutualistic interactions). Here we combine phylogenetic, trait and species assemblage (community) data to investigate the effects of color patterns and adaptation to altitude in generating and shaping the diversity of Ithomiini.Comprehensive phylogenetic and trait analyses of several genera show that shifts in altitude and color patterns are both involved in diversification. In parallel, phylogenetic analyses of 15 communities along an altitudinal gradient show that both adaptation to altitude and mimetic interactions act as ecological filters and contribute in shaping species assemblages. Moreover, we find that both factors are not independent, and species that share color patterns also share altitudinal niche more often than predicted by phylogeny alone. The two approaches undertaken here are complementary and provide support for a similar scenario, whereby ecological factors, especially positive interactions, have been instrumental in generating and shaping biodiversity. Taking other types of positive interactions into consideration may shed light on why some groups have diversified dramatically, and why others have not. We investigated the evolutionary history of the meadow spittlebug Philaenus spumarius, a widespread and polyphagous insect species of the Holarctic region, limited in its range by the presence of enough humidity in the earlier life stages, and that has a remarkable dorsal colour/pattern polymorphism of the adults. The mitochondrial gene cytochrome c oxidase subunit I (COI) revealed three main haplogroups in Europe: the “western”, the “eastern-Mediterranean” and the “north-eastern” haplogroups, which overlapped in some regions. Evidence of recent divergence events at less than one million years ago in southern Mediterranean peninsulas followed by northward population expansions were found. Recent gene-flow events between the main southern peninsulas and between the Iberian Peninsula and North Africa were also detected. 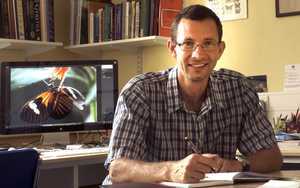 A probable British origin for the insular populations of the Azores and New Zealand was revealed, as well as multiple geographic origins for North American populations from western and northern Europe. Restriction site associated DNA (RAD) sequencing was also applied in a set of 8 populations from the different mitochondrial haplogroups and the differentiation patterns obtained from a set of over 15,000 SNPs were concordant with COI results and with a better resolved tree. The butterflies Heliconius erato and Heliconius melpomene are well known for their amazing mimetic similarities in colour pattern. These colour patterns vary across their geographic distribution with parallel hybrid zones in both species found between adjacent colour pattern races. Here we use RAD sequencing to investigate patterns of genome-wide divergence across two such hybrid zones of both species, in Peru and Ecuador. These data are successfully used to map loci controlling colour pattern differences between races and confirm previous findings that largely the same loci are responsible for colour pattern differences in the two mimetic species. In addition, these loci are among a handful of divergence outliers identified in the genomes, supporting the assertion that strong selection acting on colour pattern is one of the primary forces maintaining these hybrid zones. In spite of the striking parallels at the genomic level between species we do also find some previously unidentified differences. We also compare different techniques for analysis of this type of data, which we envisage being ever more widely used for the analysis of adaptive divergence in wild populations.